We only use prime British pork shoulder. Gluten & dairy free. Our famous Newmarket recipe with a twist is ideal for those with a gluten or dairy intolerance! 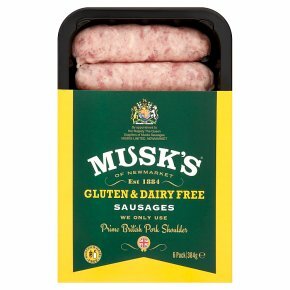 For these award winning sausages we have removed the bread and substituted it with long grain rice which, together with prime British pork shoulder meat and our secret blend of spices, all filled into natural casings retain the succulence and flavour of the Newmarket sausage. Wash hands, all surfaces and utensils after touching raw sausages.Remove all packaging.Do not pierce sausages.Guide only. Ensure sausages are thoroughly cooked until juices run clear. 40-45 minutes, turn once.190°C, 170°C, Gas 5. 25-30 minutes, shallow fry in 1 tbs oil.